Berries and chocolate have long been an amazing combination (hello chocolate-covered strawberries! ), and the combo is no less awesome when turned into a smooth and cool sorbet. 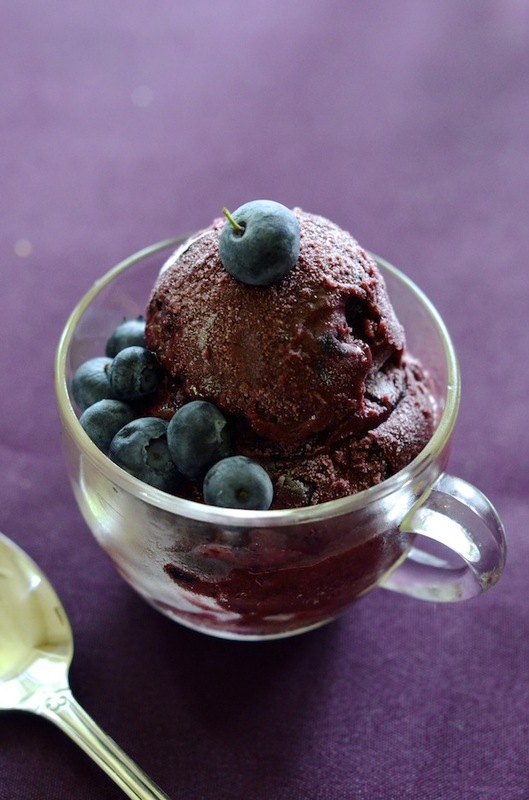 This Blueberry Chocolate Espresso Sorbet is the ultimate summer treat, with a killer combination of bright berries, rich cocoa, and just a hint of jolt from espresso. I know you might think espresso seems like a weird addition, but trust me...it just works! A bit of vodka in the recipe will keep the sorbet lovely and scoopable, but if you prefer, you can absolute skip it (though it will then be a bit harder to scoop after the first day). I love pairing this with rich dark chocolate brownies and a handful of fresh blueberries on top. Combine the blueberries and 1/2 cup water over medium heat. Let simmer until the berries burst and become syrupy (about 5 minutes). Remove from heat and let cool. In a separate saucepan, combine the espresso, sugar, cocoa powder, and chocolate chips. Let simmer, stirring occasionally until sugar and chocolate are melted. Pour coffee mixture into a blender with banana, vanilla, vodka, and salt, and puree until very smooth. Cover, and chill at least 4 hours or overnight until very cold. Pour chilled mixture into your ice cream maker, and churn as directed. 5 minutes before end of churn, add the cooked blueberries. Transfer to a container, cover, and freeze at least 4-6 hours until set.